There was probably a time when American investors did not spend a majority of their time thinking about the financial impact of international relations. As part of its monthly Confidence Index, Spectrem asks investors a single question reflecting current events or investment strategies. 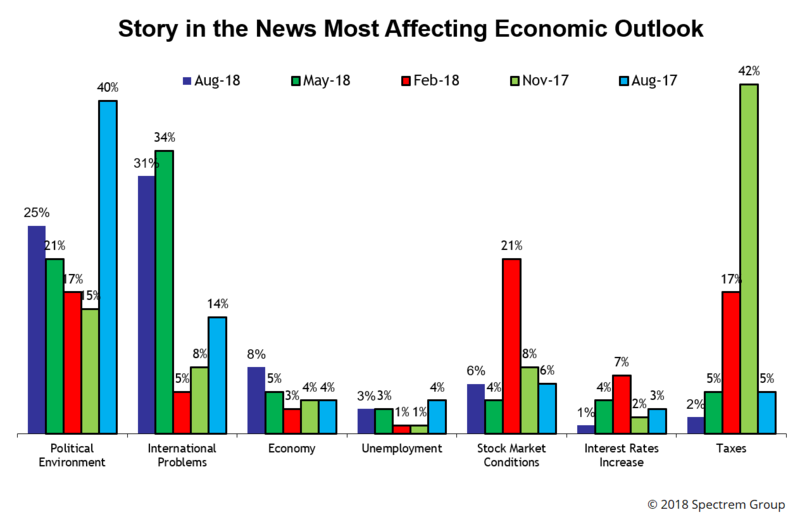 For August, the question was “What is the Story in the News That Most Affects Your Economic Outlook?” and for the second time in a row, International Problems” was the No. 1 choice of investors with a net worth up to $25 million. Each question is asked once every three months. In May, International Problems was the No. 1 choice for 34 percent of investors, and for August, the percentage was down to 31 percent. But that choice still outpolled the No. 2 selection, which was Political Environment, which earned 25 percent of the nods and increased its percentage from 21 percent in May 2018. This overwhelming response regarding international issues forces advisors to consider their research on investments. Recent events have caused a reeducation in regards to the impact of global relations, but now investors are getting involved, and demanding advisors assist them in understanding how NAFTA, TPP, Brexit and any tariff conversation matters to their investment decisions. International Problems and Political Environment have not always been the most popular answers to this question. Back in February of 2018, Stock Market Conditions was the No. 1 answer, with 21 percent of responses. Less than a year ago, in November of 2016, Taxes was the No. 1 answer and received 42 percent of the selections. And then, in November of 2016, Political Environment was the top selection, and was almost the only selection, getting 83 percent of the votes. In the August polling, the third-most popular response was the Economy, with only 8 percent of the nods. Stock Market Conditions got 6 percent of the selections.